Summer is quickly approaching and there are so many outdoor activities to discover in Branson! 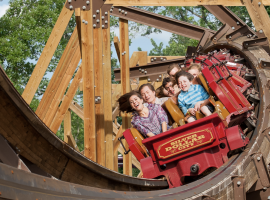 For the adventurers, check out Silver Dollar City! Enjoy a day of riding thrilling roller coasters like Outlaw Run, Powder Keg, and the newest coaster, Time Traveler. Each coaster brings its’ unique design to make each ride experience exciting! If thrill rides aren’t for you, check out the Track Family Fun Parks. Spend the day riding go-karts, bumper cars, or bumper boats. With numerous go-kart tracks, it is easy to find the perfect track for each person in your family. From children’s tracks to 3-story tracks, there’s fun to be had by everyone. When the heat begins to get to you, cool off with the bumper boats! There’s a good chance you’ll get soaked! If you’re looking to beat the heat and find indoor activities, there are several shows that the entire family will enjoy! The Amazing Acrobats at Mickey Gilley’s Grand Shanghai Theatre showcase the talented acrobats! See numerous stunts and graceful acts as they share their skills. Another great family show that everyone will enjoy is the Amazing Pets show at Grand Country Music Hall. This show features exotic birds, extremely talented dogs, and many other furry friends! With so many options to choose from, planning the perfect summer vacation to Branson will be easy! If you need assistance or would like recommendations, call 877-368-3782!